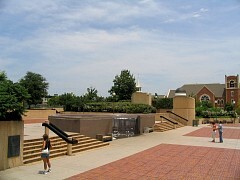 Margaret thought it would be a good idea to stop at the Oklahoma City Bombing Memorial. On this trip we have previously stopped at the Alamo, site of a famous massacre, and Dealey Plaza, site of the assassination of a U.S. President. Crystal remarked that, "We sure were stopping at a lot of sad places". The "Tour of Tragedies" moniker was born. 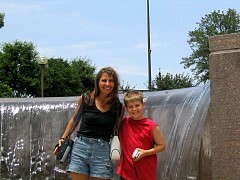 Here I am using for the first time my 3.2 megapixel Cannon A70 digital camera. I like the quality of picture it produced. 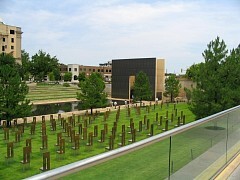 In the picture just to the left, the memorial is in back of the vine-covered wall and up to the building that looks like a next-door-neighbor building is missing. Indeed, the explosion necessitated several nearby buildings to be razed. 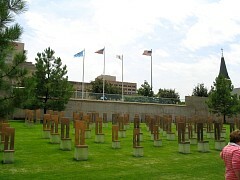 On April 19, 1995, in Oklahoma City, Oklahoma, a truck bomb exploded a two-ton bomb outside the Alfred E. Murrah federal office building, collapsing wall and floors. 168 people were killed, including 19 children and 1 person who died in rescue effort. Over 220 buildings sustained damage. 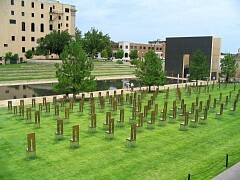 Timothy McVeigh and Terry Nichols later convicted in the anti-government plot to avenge the Branch Davidian standoff in Waco, Texas, exactly two years earlier. 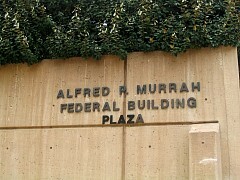 Above Margaret and Alec check out what was the back of the Alfred E. Murrah Federal building. 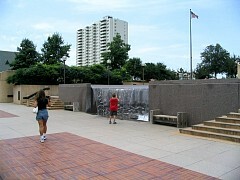 This waterfall was part of the original building. 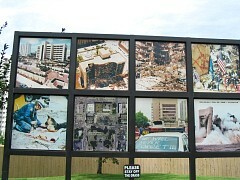 Here are pictures of panels at the memorial that show scenes of the aftermath. Enlarge them to see them better. Ditto. Enlarge the picture above far left and look for the waterfall. That's the same waterfall as above. 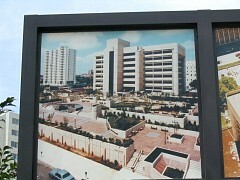 That same picture shows the building from the back. The truck bomb was driven along the street that passed in front of the building, where it was detonated. 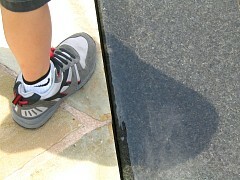 Here is one of the more important parts of the memorial. This grassy area is the actual footprint of the original building. 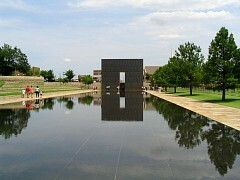 The reflecting pool covers where the street that ran in front of the building ran. 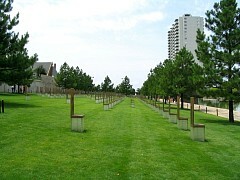 The rows chairs represent by floor of the building the victims - each seat has a victim's name on it. There were 7 floors and a basement, hence 8 rows of chairs. 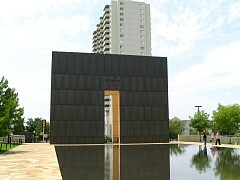 There are bookend-like walls that frame the water covered portion of the memorial that was originally the street in front of the building. 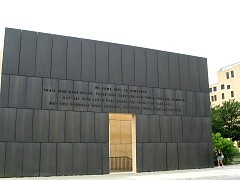 Visitors enter into the memorial by passing through one of the two "Gates of Time", monumental rectangular structures with a narrow slit of an entrance. The East gate represents 9:01 and the West gate represents 9:03. The gates account for the minutes before and after the bombing took place. Once inside the gates, visitors enter into the minute of time in which the tragedy occured. Alec's foot captured in an artistic manner. This shows how shallow the pool is. 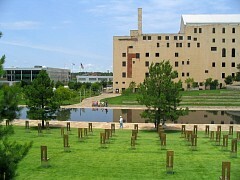 The Oklahoma Memorial further encourages the public to engage the events of the bombing within both a museum and a center focused on terrorism. 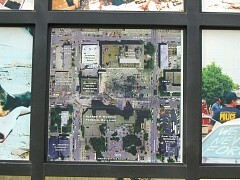 The museum is filled with artifacts recovered from the bombing site. Many of the items that filled the Murrah building and belonged to the victims were recovered and are now placed on display. 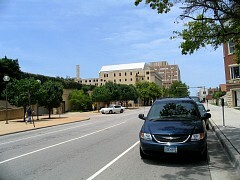 In addition the museum offers visitors the opportunity to hear a taping of the bombing, recovered from the minutes of a meeting that was occurring across the street, allowing visitors to relive the moment of horror and panic for the victims. 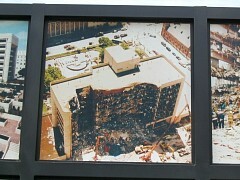 Items within the museum offer the visitor a haunting picture of the ensuing destruction.